Seattle Fishing Charters, Everett Fishing Charters with All Star Fishing Charters open now. Fishing in the Pacific Northwest is legendary. Adjacent to Seattle and Everett’s historic ports lies the calm waters of Puget Sound, where a mild year-round climate makes it possible to experience unforgettable fishing any time of year. 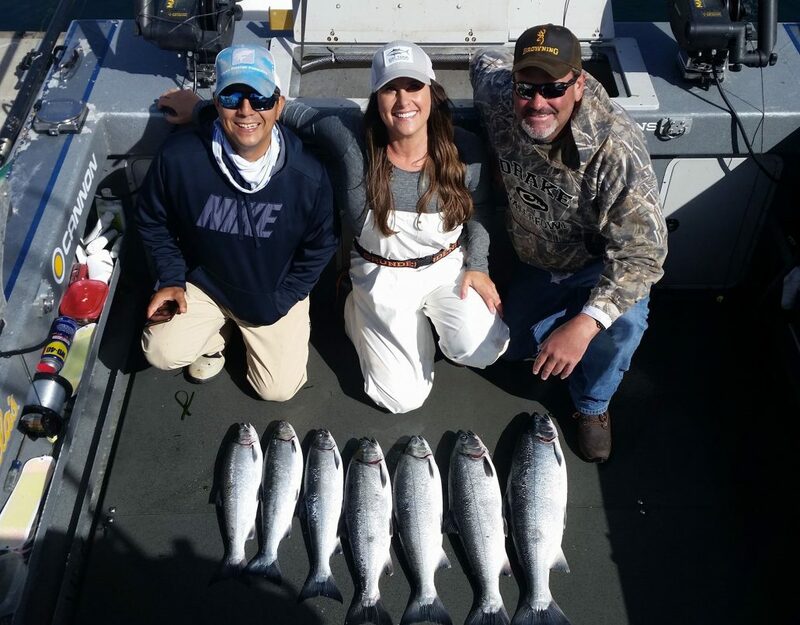 The best Seattle or Everett fishing charters are all about tight lines, beautiful scenery and a day spent on the water with family and close friends in a place where whales breach beneath the endless backdrop of the Olympic and Cascade Mountains. At All Star Fishing Charters in Seattle or Everett, our job is to make your day of fishing one that you’ll never forget. Come visit a place where fish like to cooperate, with captains who have the local fishing experience required to help you target every local fish species. Your All Star Fishing Charter captain will put you front-and-center on the action while maintaining your safety and comfort on one of our clean, comfortable vessels. Are you ready to experience the best fishing Seattle or Everett has to offer? Give us a call today and become a Fishing All Star with our award-winning team. At All Star Fishing Charters, making sure you are having fun is the main goal. 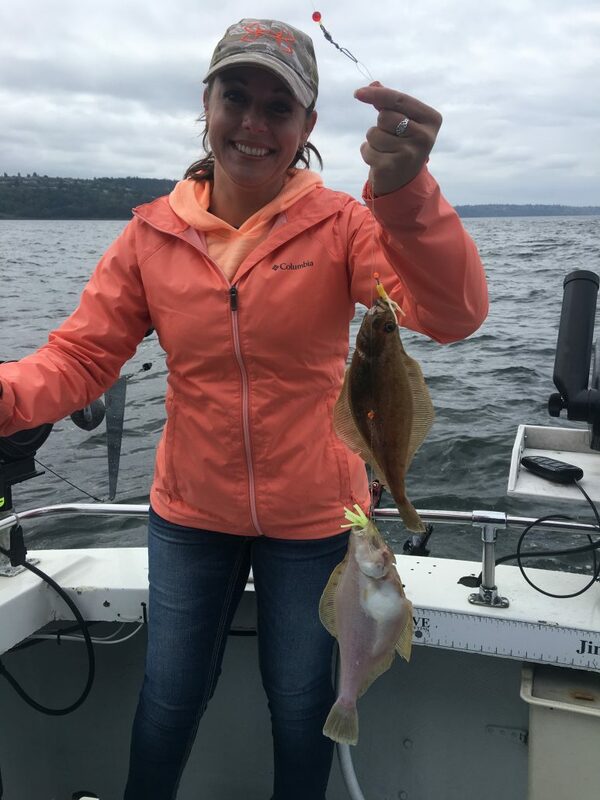 Achieving this goal is all about spending a day on the water with friends and family while enjoying the thrill of fishing Seattle or Everett’s famed waters. What makes Puget Sound truly special is the unspoiled nature that rolls out in every direction. From broad mountain ranges to playful harbor porpoises, the area is filled with natural treasures that makes this region like no other. When you experience a Seattle or Everett fishing charter with our experienced captains, they understand that this is your trip. You will fight your own fish. They will do everything possible to help you get your fish in the boat while treating you with the respect you deserve. Your Seattle or Everett charter captain is a family person just like you, so they understand what you expect from your hard-earned dollar. If you’re a novice or new to salmon fishing, your skipper will offer as must guidance and assistance as you need. 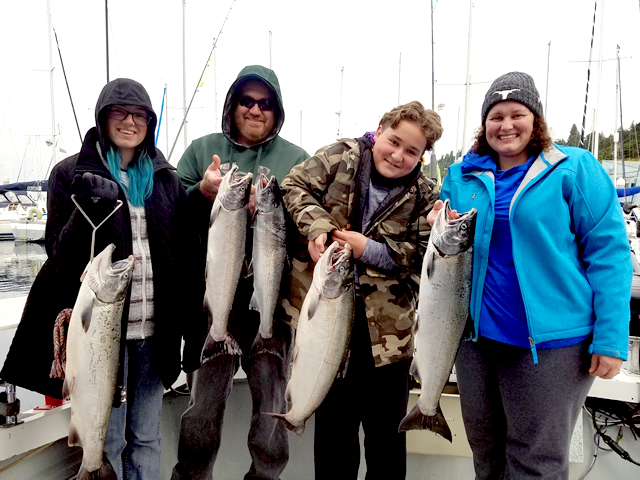 This is especially helpful if you have children who are just getting started in the sport of fishing, because it’s extremely important that they enjoy their Seattle or Everett fishing charter experience. At All Star Fishing Charters, we value preparation as a key ingredient to fishing success. This means that all the gear, tackle, and equipment will be well maintained and in prime condition. You don’t have to worry about losing a big king salmon because of old line or faulty reels. We take the time necessary to ensure you don’t have to think about the things you’re paying someone else to think about. Free use of the highest quality rods and reels that allow you to fight and land your fish. Your gear will include top of the line fishing rods perfect for Puget Sound fishing. These top of the line rods are equipped with Shimano reels, which are the envy of professional anglers everywhere but simple enough for anyone to use. For trolling, your boats will be outfitted with state of the art Cannon Mag 20 electric downriggers for precise controlled depth fishing, the most effective method for catching Puget Sound Salmon on your Seattle or Everett fishing charter. Whenever you book a Seattle fishing charter, pay special attention to the boat and the gear. A clean vessel and well-maintained gear are hallmarks of a professional fishing guide that takes pride in their work. All Star Seattle Fishing Charter boats are equipped with U.S. Coast Guard approved safety gear, life preservers, GPS, VHF Radios and top of the line Lowrance electronics. All your bait, tackle, and gear will be provided. You’ll be using top of the line fishing rods, outfitted with Shimano fishing reels. These outfits are easy to use, and capable of handling trophy sized fish. The gear you’ll use is well maintained. Sharp hooks and fresh line are often difference makers when fishing in Puget Sound, so always make sure you fish with a captain who understands the importance of fishing fundamentals. In Puget Sound, we are blessed with moderate conditions that allow us to fish 12 months a year. Most of that time is spent fishing for salmon and our professional captains have decades of experience that give you the best opportunity to catch these beautiful and tasty fish. Our boats are set up with the latest electronics and tackle to maximize your fishing experience. Our technique of downrigger trolling on Seattle fishing charters is far and away the most effective method of catching salmon in the local waters and our captains are more than happy to share that knowledge with you. You’ll learn how we set up the fishing tackle, integrate the use of electronics and how we use the local tides to predict where the salmon are most likely to be on your trip. Regardless if you are an experienced angler or this is your first time ever fishing, our captains will do everything in their power to make sure you have a trip that will leave you with memories that last a lifetime. Puget Sound Summer King Salmon fishing runs during the months of July and August as the mature fish return from the Pacific Ocean and head to their rivers of origin to spawn. These king salmon are the largest we encounter during the year and will occasionally exceed 20 pounds. They have a very firm tasty flesh that is second to none on the dinner table. Summer Kings are known for long powerful runs and battles that can test even the most experienced angler. 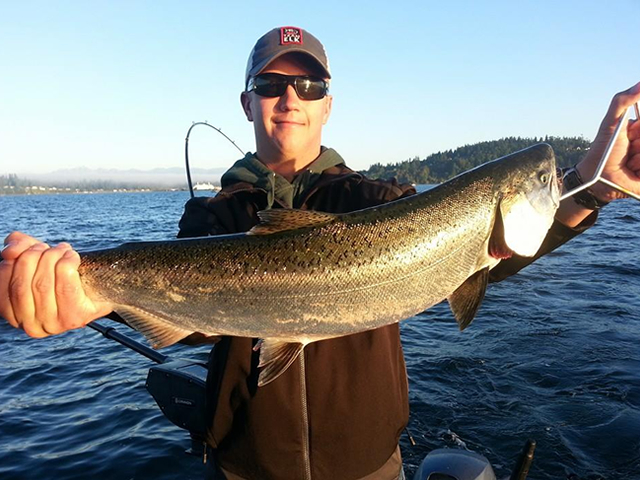 Puget Sound Winter King Salmon fishing typically starts in November and runs through April. These fish, locally known as “blackmouth” or “winter kings” are juvenile king salmon that feed in Puget Sound most of their life. They are well known for their flavor and tendency to be more consistent feeders than their mature cousins in the summer. You are likely to encounter winter kings in the 4-10-pound range though bigger fish are occasionally caught on some Seattle fishing charters. 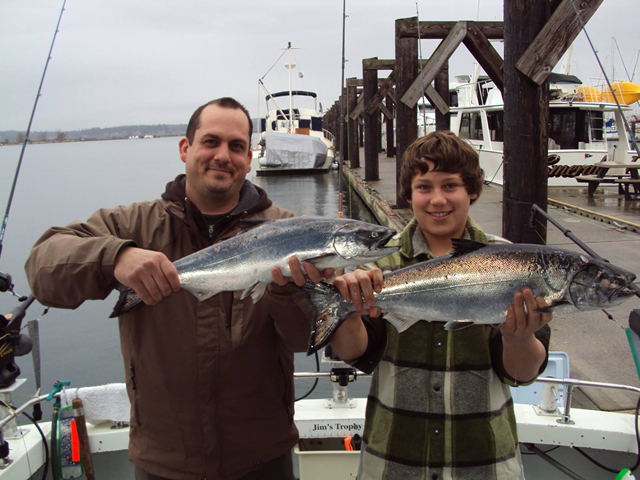 Puget Sound Coho salmon fishing typically starts in early July and runs well into October. These fish, which range in size from 3-12 pounds, are known for their acrobatic fighting style on the surface. Unlike their larger king salmon relatives, these fish are more prone to schooling and it is not uncommon to hook more than one fish at the same time. Like the king salmon, this species has a firm tasty flesh that is great on the dinner table. 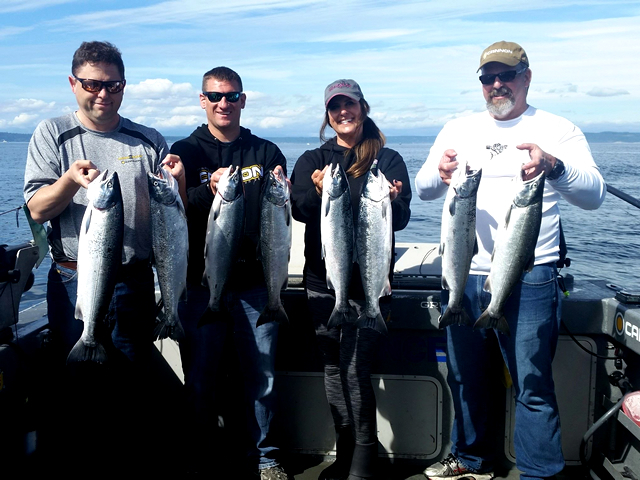 Puget Sound Pink salmon, chum salmon, and sockeye salmon also run in Seattle’s or Everett’s waters, and at certain times of the year, your fishing charter will focus on these species. Pinks, also known as “Humpy” salmon, only run on odd number years in Puget Sound. They are the most numerous of the salmon species and make for a great Seattle fishing charter, especially for groups with children or novice fishermen. The flesh of the Pink salmon is more tender than other species but when properly cared for by your captain, make excellent table fare and great smoked salmon due to their high oil content. Lingcod fishing in Puget Sound takes place during the months of May and the first half of June when our local salmon seasons are closed. These meaty fish with large toothy heads aren’t going to win any beauty contests, but they put up a terrific fight and are one of the best eating fish in the ocean. Their flaky, firm white flesh can be grilled, sautéed or fried, and some people even call it “poor man’s lobster,” when prepared to mimic the clawed crustacean. Your captain will use several techniques to catch lingcod on your Seattle or Everett fishing charter, from you catching your own live bait to using special lures depending on the conditions and what they’re eating on that day. Want fun fast fishing? Flounder fishing from April thru October can provide a great time for kids and adults looking for quick and easy action. It is not uncommon to get a bite nearly every time you bait hits the bottom once the schools of fish are located. Pacific Sand Dabs are the most abundant bottom fish in Puget Sound. Sand Dabs are a small Flounder species that live on the bottom and migrate into the sandy shallow sand bars of Puget Sound during the spring and summer months. Pacific Sand Dabs though small, are very plentiful and easy to catch during the warmer months. Sand Dabs have a flaky white meat that many people enjoy. They can be cooked in many different methods, from steaming them whole to deep frying the fillets. Sand Dabs are the most aggressive biters that Seattle or Everett fishing charters have to offer. The fish come in swarms, it is not uncommon for everyone on the boat to have a hook up at the same time, with multiple lines fishing. The key is to locate them, and you can be assured that All Star Fishing Charters captains know where. Great action-packed fishing for kids of all Ages! Dungeness crab fishing is also possible on Seattle fishing charters during certain periods of the year, as the seasons allow. Abundant in local waters, “Dungies” as they are known, possess a delicate, sweet flesh that most folks love. Dungeness crab fishing is a “hands on” fishery that lets you assist in the setting and retrieval of the gear. If you would like to fish for crab on your charter, let us know at time of booking. 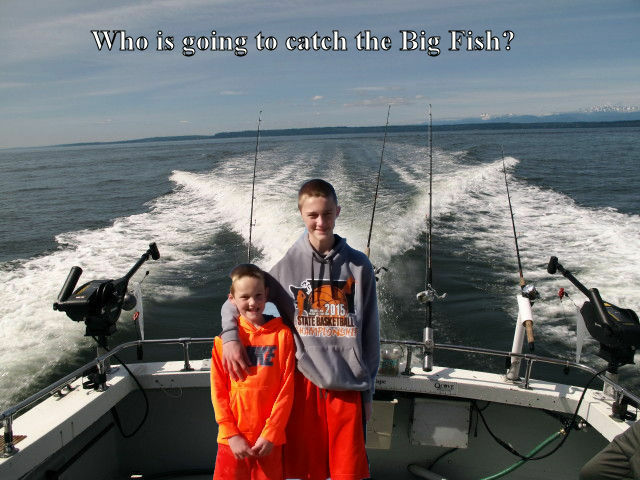 At All Star Fishing Charters in Seattle or Everett, we love our home and we love fishing. Your fishing adventure will be one that you’ll never forget. An experienced local captain who takes great pride in his work will be your guide, and do whatever he can to make your day memorable. Look at our online reviews, and you’ll see that our customers appreciate our skill and dedication. Contact us today to set up your own Seattle or Everett fishing charter. If you have any special needs or requirements, we are happy to do whatever we can to accommodate you and your party. Customize your fishing charter in whatever way you desire, and we will do our part to make sure you have a fun trip with memories to last a lifetime.